ISKT : Squad – Communicate. Coordinate. Conquer. International Squad Knockout Tournament is collaborative community-run tournament that brings clans together from across the entire world to compete in a competitive environment for the chance to win prizes and bragging rights for being a top clan/community in the world. Through their strong focus on bringing as many of the matches to the public via their top tier broadcasting, ISKT allows everyone to see the strength of the competitive community in Squad and how they can take their gameplay to a whole other level of skill. ISKT prides itself on uniting gamers from across the globe to bring Squad to an eSport-type environment. A large majority of clans involved help to supply servers, referee matches, and cast the events. Without the community supporting this initiative, there would be no ISKT. With servers, and clans for that matter, ranging from Russia, to Australia, North America, Europe, and the Middle East, there is no shortage of diversity for those that choose to take part in the ultimate thrill ride through ISKT events. Although many previous leagues and competitions have existed in the short interim that Squad has been in public alpha, ISKT has continuously shown growth season to season in terms of participating clans/communities and positive interactions from the community. InternationalSquad.com contains many unique features that encourage community participation. Community created articles can be written by anyone who signs up on the ISKT webpage and allows an open discussion on anything the author deems important. Current topics range from proper mortar usage, clan history threads, rushing methodology, and competitive Squad in general. You help define the community. The webpage also boasts interactive calendars for anyone to observe when scheduled matches are occurring, who will be refereeing, and how they can watch their favorites compete. The “Betting” feature allows for another level of interaction, letting anyone place a non-monetary bet on the outcome of matches. Community members can accumulate a total, demonstrating their prowess at the end of a season to as they guess who will be crowned the next “Best in the World” competitor! The roots of ISKT are deeply tied to the community that willingly supports, in large part, tournament matches with servers, community casters volunteering their time and efforts, donations to help upkeep and maintain servers and websites, and, let’s not forget, the ability to plan large scale, 24v24, matches multiple weeks in advance for the taste of glory and bragging rights! 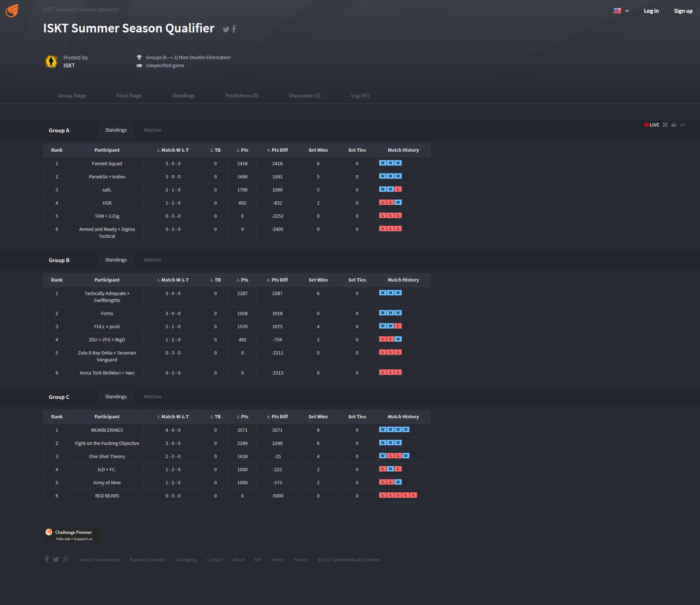 ISKT Summer Qualifiers (group play/round robin – format) is currently underway for ISKT Season 2, to determine which teams will make it to ISKT Premier (ISKT-P). As part of the qualifiers, all teams will play each other in their specific group, one time. The top two teams from each group and the “next two best” will advance to ISKT Premier (8 teams total). ISKT-P will start sometime in September, and will have a double elimination knockout format (similarly to ISKT Season 1). The winner will be crowned the Champion of ISKT. Also starting in September, ISKT Open (ISKT-O) will be for all interested clans/communities to join where they will compete in round robin play and then playoffs with a single elimination knockout format. Any team or community is available to sign-up for ISKT-O to compete. Group play will seed teams based on region so Oceanic/North American teams will face one another and European teams will face one another. The strongest teams for the group plays will be moved to a single elimination ISKT bracket where they will crown a 1st, 2nd and 3rd place. Down the road, ISKT will look at promoting teams from Open to Premier, and vice versa, in an effort to keep competition fresh and rewarding/engaging for clans involved. Teams that do well in ISKT-O could eventually work their way into ISKT-P and perhaps one day all the way to the ISKT-P Grand Finals.